Anyway to de-fat this recipe without affecting the outcome? You could de-fat it a lot by substituting ingredients. Low or fat-free cream cheese and low fat peanut butter would be a big fat and calorie cutter. I don’t think Nutella comes in any low-fat form, but you could also sub fat-free Cool Whip for the whipped cream. I use that a lot, and it works in fresh or frozen pies. I think the Nutter Butters are stuck being full calorie too, unless one of the diet brands sells something “healthier”. Good luck and let me know what you think if you go that route. 🙂 Thanks for reading! Definitely no low-fat in the pie the way it’s made here. But, you can easily substitute low-fat butter, cream cheese and peanut butter and use fat-free cool whip in place of the whipped cream. 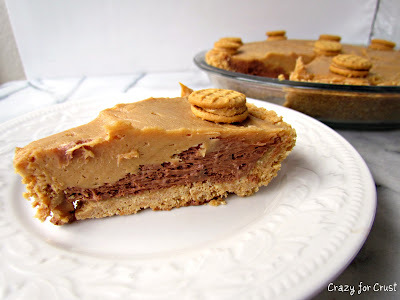 WW has a peanut butter pie I love that uses all those ingredients. It’s SO good. dorothy, this looks fabulous! i’m a huge nutter butter fan and can’t wait to try this pie. Q: Is there a GFree option for the Nutter Butters? Hmmm…I’m not sure. I’ve never bought Gluten Free products, but I did a quick google search for GF peanut butter cookies and some packaged brands came up. Maybe try Amazon? Or Whole Foods, possibly. Good luck, and let me know if you find anything! Can you please Pin this? 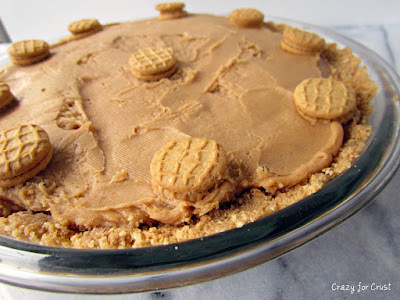 There is a similar recipe on your Pinterest board, but not exactly the same as it does not have the peanut butter in it. I pinned it to the “My Stuff” board on my pinterest page (Dorothy @ Crazy for Crust). Thanks for reading! I know what Hubby is getting for Father’s Day! PS What if I don’t have a food processor? He’ll love it! If you don’t have a food processor you can put the cookies in a ziploc bag, seal it all but about 1/2″ (so air can escape) and use a rolling pin to crush the cookies. It won’t be as fine of a crumb but it’ll work just fine. Or, you could buy yourself the food processor and then pretend it’s his gift and you thought that’s what he asked for. Or would that be a stretch? That looks SO yummy! 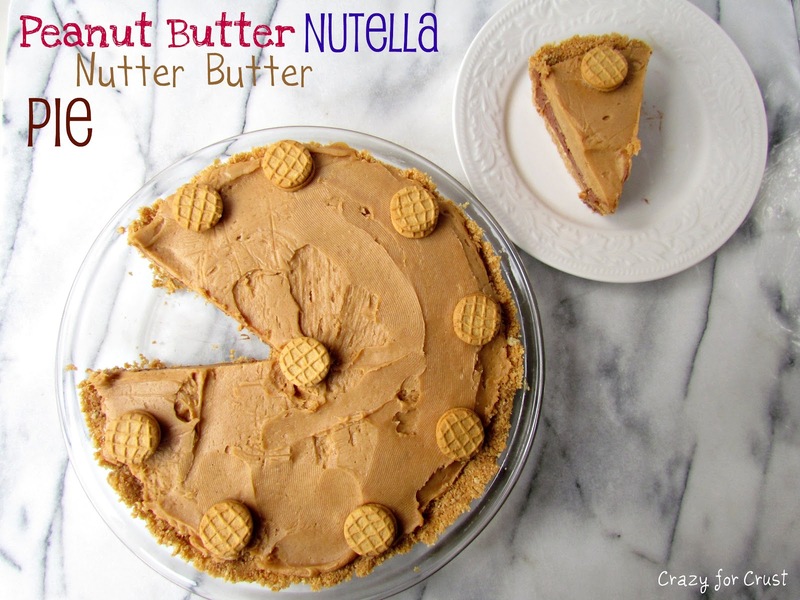 I featured it today on my “Top 10 Nutella Recipes” post. Feel free to grab a “featured” button. Also I would love for you to share this (and any other creations) at my new linky party “Pin It and Win It Wednesday” @www.cheapcraftymama.com! omg omg omg. This looks SO AMAZING. Pinning this, can’t wait to make it. Need a reason ASAP. Hi we don’t get nutter butters in South Africa, but I make my own peanut butter cookie recipe which is gluten free and delicious. 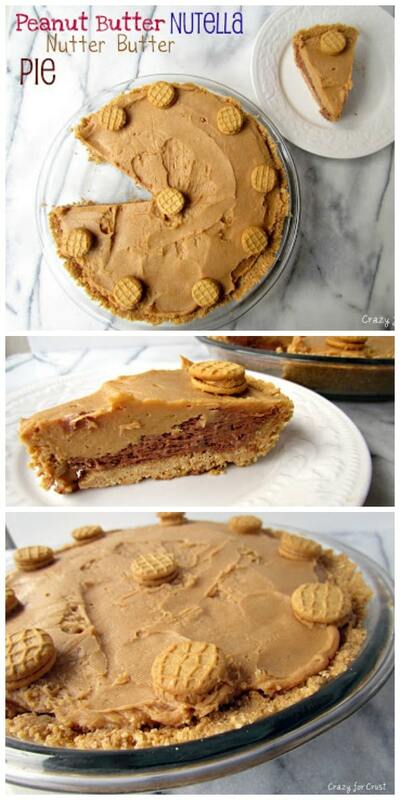 1 cup peanut butter, half a cup of brown sugar, a pinch of salt and an egg. Mix together, use a teaspoon to make balls place on baking paper and flatten slightly with a fork – they do spread quite a bit. Bake at 160 C until a crust forms on the top – about 12 mins. I use a home gas oven so I have learnt to bake by smell and feel rather than temperature and time so some experimentation may be needed ;). These with Nutella and cream would be wow. Yum!!! Thanks for the tip Lauren!